In 1928, physician and researcher Harrison Martland published a scientific paper titled Punch Drunk. In it, he described 23 cases of boxers who had started to display neurological symptoms after experiencing the repetitive head trauma that goes hand in hand with their sport. They sometimes developed symptoms that resembled Parkinson's disease, like tremors and abnormalities in gait, as well as more general types of cognitive deterioration. About a decade later, another researcher gave a new name to Martland's punch drunk syndrome, calling it dementia pugilistica. A year before Martland's popularization of the term punch drunk syndrome, physicians Michael Osnato and Vincent Gilberti had published a review of cases of what was known at the time as postconcussion neurosis---a neurological disorder that emerged after a concussion. Osnato and Gilberti concluded that concussions could be associated with subsequent neurodegeneration, or the degeneration and death of neurons. Because the pathology they saw in the cases they studied resembled the effects of a type of brain inflammation known as encephalitis, Osnato and Gilberti decided this disorder should be called traumatic encephalitis, which soon was modified to traumatic encephalopathy. In 1940, researchers Bowman and Blau coined the term chronic traumatic encephalopathy when describing the case of a 28-year old professional boxer who had been unable to get commisioned to continue boxing because he was suffering from a number of symptoms including paranoia, depression, memory deficits, and impaired cognition. Bowman and Blau added the word chronic to Osnato and Gilberti's original terminology because this patient's case had not improved over the course of 18 months. They thus called the condition chronic traumatic encephalopathy, or CTE. Although the first reports of CTE described boxers, it wasn't long before similar symptoms were reported in American football players---and players of any sport that involved the potential for multiple head injuries. It wasn't until 2005, however, that widespread attention was focused on American football as a potential cause of CTE. This attention followed the publication of a report by neuropathologist Bennet Omalu and colleagues after the examination of the brain of former NFL player Mike Webster. Webster had died of a heart attack but had suffered from memory problems and depression late in his life. 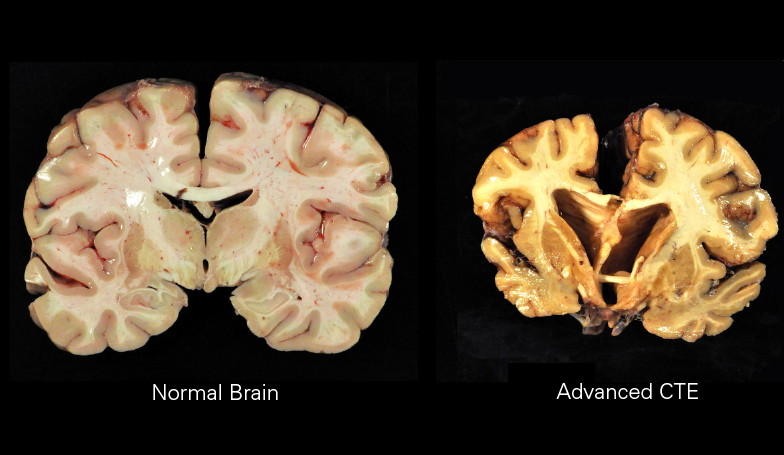 Upon autopsy, it was found that Webster's brain showed signs of degeneration and the researchers concluded that Webster had suffered from CTE. Autopsies of the brains of a number of other football players have resulted in similar observations. CTE is a neurological condition thought to be the consequence of repetitive head trauma, although other risk factors must also be at play since not everyone who experiences repetitive head trauma develops CTE. Symptoms associated with CTE generally begin to appear years (sometimes decades) after trauma and may include: problems with cognition like memory and attentional deficits; behavioral abnormalities like paranoia, aggression, and impulsivity; mood disturbances like depression, anxiety, and suicidal thoughts; and movement problems like tremor and other Parkinsonian symptoms. In the majority of cases, the symptoms of CTE are progressive---meaning they get worse over time. Despite a long list of recognized symptoms, however, there are no widely accepted diagnostic criteria that define what CTE should look like (although at least two sets of diagnostic criteria have been proposed). Sometimes CTE is defined specifically as the pathological changes that occur in the brains of patients, while the presentation of symptoms is called traumatic encephalopathy syndrome. Typically, CTE is associated with repeated concussions and subconcussive blows (i.e. trauma that doesn't result in clinical symptoms). The evidence is not clear at this point as to how many instances of head trauma are required to cause CTE, or if it could be caused by one incident. Also, not everyone who experiences repetitive head trauma will develop CTE, which suggests that other factors must also be involved. But researchers are still working to identify those other risk factors. Populations who are at risk for frequent head trauma are also most likely to develop CTE, as CTE has been observed in: boxers, American football players, professional hockey players, professional wrestlers, victims of physical abuse, military personnel, and so on. It's important to emphasize that, as mentioned above, head trauma does not have to result in clinical symptoms to increase the risk of CTE. Someone who takes frequent blows to the head may be at greater risk of developing CTE, even if those blows don't result in concussive symptoms. What happens in the brain in CTE? The pathological features of CTE in the brain are perhaps better defined than the overt symptoms of CTE. The principal feature is the accumulation of a protein called tau into insoluble clusters, also known as aggregates. This process is thought to begin when tau protein becomes hyperphosphorylated, which means that multiple chemical groups called phosphoryl groups have attached to tau to the point where no more can attach to the molecule. At this point, tau, which normally interacts with and helps to maintain the stability of microtubules in the cell, disassociates from the microtubules. Then, the hyperphosphorylated tau protein forms the aggregates mentioned above in neurons and astrocytes surrounding blood vessels in the brain. The clusters of tau are called neurofibrillary tangles when they appear in neurons and are often called astrocytic tangles when they appear in astrocytes. The tau aggregates in CTE form in the cerebral cortex, primarily at the depth of the invaginations of the cortical surface known as the cortical sulci. These aggregates may also form in other layers of the cortex, some regions of the hippocampus, and in other subcortical nuclei. What effect these clusters have exactly is still uncertain, as while their presence is correlated with the severity of neurodegeneration, it has not been clearly demonstrated to cause it. Still, neurofibrillary tangles are thought to be able to disrupt cellular communication, which could lead to detrimental effects on the cell. They also have the ability to pass from one affected neuron to other unaffected neurons, which seems to indicate a potential for the pathology to spread within the brain. Aggregates of tau are found in other neurodegenerative diseases like Alzheimer's disease as well, and some hallmarks of other neurodegenerative diseases, like the amyloid plaques commonly seen in Alzheimer's disease, also occur in CTE. But the distribution of tau in CTE, as well as the absence of defining features of another neurodegenerative disease is what allows for the diagnosis of CTE. For example, if tau-associated degeneration occurs in certain regions of the hippocampus alongside the formation of amyloid plaques, it would be indicative of Alzheimer's disease rather than CTE. While tau deposits are the primary microscopic sign of CTE, there are also more evident signs, like reduced brain weight, atrophy of the cerebral cortex (especially in the frontal and temporal lobes), atrophy of various other regions of the brain like the hippocampus and amygdala, enlargement of the ventricles, and thinning of the corpus callosum. CTE has received a great deal of media attention over the past several years, and this has led to some misunderstandings about the prevalence of the disorder. For example, in 2017 a story about CTE in National Football League (NFL) players received a lot of media attention, with headlines reporting that CTE was found in 99% of brains of NFL players that had been studied. This study, however, used brains that had been donated to be studied for CTE, regardless of whether or not symptoms had emerged during the players' lives. This introduces a potential source of bias, as relatives of players may have donated the players' brains because of concern about symptoms that had arisen during the players' lives. In other words, many of the brains involved in the study may have been donated because of concerns about CTE, making it less surprising that almost all of the brains showed signs of CTE. Due in part to the potential biases surrounding brain donation for CTE study, the actual prevalence of CTE is difficult to estimate. One study that included a larger brain bank found CTE in 31.8% of the brains of individuals with a history of repetitive head trauma, and no cases among 198 brains without such a history. Larger studies are underway now to try to get a better sense of how prevalent CTE is in the general population. Read more about the neuroscience of traumatic brain injury. Asken BM, Sullan MJ, DeKosky ST, Jaffee MS, Bauer RM. Research Gaps and Controversies in Chronic Traumatic Encephalopathy: A Review. JAMA Neurol. 2017 Oct 1;74(10):1255-1262. doi: 10.1001/jamaneurol.2017.2396. Montenigro PH, Corp DT, Stein TD, Cantu RC, Stern RA. Chronic traumatic encephalopathy: historical origins and current perspective. Annu Rev Clin Psychol. 2015;11:309-30. doi: 10.1146/annurev-clinpsy-032814-112814. Epub 2015 Jan 12. Long-term depression, or LTD, is a process by which synaptic connections between neurons are weakened. Although the functions of LTD are not completely understood, it may be important to memory formation---perhaps by resetting previous synaptic changes to allow for new memories to be formed via long-term potentiation (LTP). In this video, I discuss the best understood mechanism underlying LTD, which involves AMPA and NMDA glutamate receptors.